When starting a company, receiving and implementing good advice early on can be the difference between success and failure. In Upstate New York there is a lot of wisdom available to first-time entrepreneurs to help save them time, money and heartache throughout their journeys. Advice for Startups: Define Value, Create Scale and Build Fast! In this blog we’ll learn from seasoned investor and UNY50 member John Cococcia about three key elements for making a startup take flight. Cococcia has spent the last 15 years working with early and growth stage companies as an investor, board member, advisor and advocate, completing over 30 M&A and financing transactions. He’s now the VP of Strategic Marketing and Investor Relations at Plug Power, and a Venture Partner with Armory Square Ventures, an early-stage venture capital fund in Syracuse, NY and New York City. Cococcia specializes in strategic development and execution, C-level recruiting, growth finances and EXITS. Here’s what he had to say about Defining Value, Creating Scale and Building Fast! Cococcia advises startup founders to make sure they understand what drives the customer. This means not only thinking about their product’s benefit to the customer, but also about the lifecycle of the product. Are there other things the customer needs to get VALUE out of your product? In doing this, a founder may recognize the hurdles in their idea during the early stages of development, saving them an incredible amount of time and other resources. Micah Green, Founder and CEO of Maidbot, a housekeeping robot primed to revolutionize the hospitality industry, recently won the LaunchNY Startup Pitch Competition at The Tech Garden. 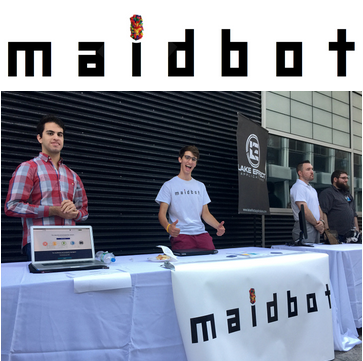 Judge and LaunchNY Entrepreneur in Residence Bob Kot said Maidbot was the standout startup of the competition in part due the company’s value proposition. In line with Cococcia, Kot also encourages other startups to interview a minimum of 50 potential customers when accessing a product’s value. Read the full story here. Every entrepreneur has the inherent desire to grow their startup, but each type of business has a different set of advantages and disadvantages when it comes to achieving scale. Cococcia explains this is why each founder needs to start by defining the product in their business model to more clearly see the startup’s growth potential. There are several things to consider when building a business model to scale, from creating an attractive business plan for investors, to surrounding yourself with a strong team, Here’s a great article published by Forbes: 10 Tips for Building the Most Scalable Startup. While writing a business plan and getting funded are critical to a launching a business, the emotional endurance a startup founder needs to succeed is just as important. Therefore, each founder needs to develop ways to build courage and break through their fears. Cococcia suggests keeping your development lean and focusing on getting the product into the customers’ hands. The sooner you receive feedback, the faster you can create the next version, warranting more resources. To learn more about how to see your idea in action quickly by validating, financing and scaling your business to a successful end game, read Chuck Stormon’s book: Start Fast! With over 25 years of experience starting companies, Stormon shares everything he’s learned about the Lean Startup Process, including how to test and refine your business model before investing a lot of time and money. Of course, all of this advice is easier to take in, but often times difficult to execute. This is why Upstate Venture Connect encourages all entrepreneurs to lean on the experience available throughout the Upstate New York startup ecosystem. If at any time throughout your journey you need mentorship, education or access to funding, reach out to UVC for support. We’re on a mission to transform UNY, one entrepreneur, one startup, one community at a time by building, measuring and celebrating Upstate New York’s startup economy.